Yesterday, a new app, Yo, took my Twitter stream and life by storm. It does nothing more than send of receive the message ‘Yo’ from people on your Yo network. For explanation, you can read here, for backstory here and for its $1m financing round, here. I’ve installed it and I have been sending and receiving Yos all day. It is strangely comforting. I have no idea why. Given that it was launched on April fools day and that Apple initially rejected the app because they though it was incomplete (there’s nothing that smells like potential disruption more than an App Store rejection because the reviewer can’t understand its point), the 8 hour project might be considered a joke or some artistic statement on our informational economy. But it seems that those who created Yo have seen more potential. It all comes back to information. My first reaction (and I was not alone) was that Yo’s success would breed clones. I figured that one of the first would be a clone that instead of ‘Yo’ sent ‘Hodor’ after the Game of Thrones character who only says ‘Hodor.’ But there is a reason that character is funny: he can only say Hodor and it is often unclear why he is saying it. So it was with most of the Yos I received and sent yesterday. But then something happened. It was dinnertime and I sent my son a ‘Yo.’ He put 2 and 2 together and realised that I was calling him for dinner. What he had was context. He saw who sent the Yo, the fact that I sent it and the time and that triggered a hunger response and he was downstairs like one of Pavlov’s dogs. For me, it was a two touch action rather than the usual shouting up the stairs so that he could hear me over his headphones. Given context, Yos are powerful informational tools. So long as there is a basis for someone to infer why Yo was sent (and indeed, therefore, to understand situations where no Yo is sent), it is a simple alert. Paired with context, it communicates a ton of information. This is not a new idea: indeed, it is the very foundation idea of Claude Shannon’s famous theory of communication. One implication of this is that the ‘same’ message in terms of bits can actually contain much more information than that when it is communicated. The reason is that the sender and receiver understand the context. Compare this with the new Facebook app released the other day, Slingshot. This is an app that allows you to send pictures easily to friends. But whereas ‘Yo’ is constrained in the information actually sent, Slingshot is incredibly vast. Yet at the same time, the contextual information has to be communicated along with that information otherwise no one will really understand what that particular picture was all about. Add to that the fact that you can’t actually view a picture until you send one back and it is clear that the ratio of informational content to message size in Slingshot is extremely low. Put simply, it is a horribly inefficient communication tool. That means it must be something else but I have to admit, I have no idea what that is. 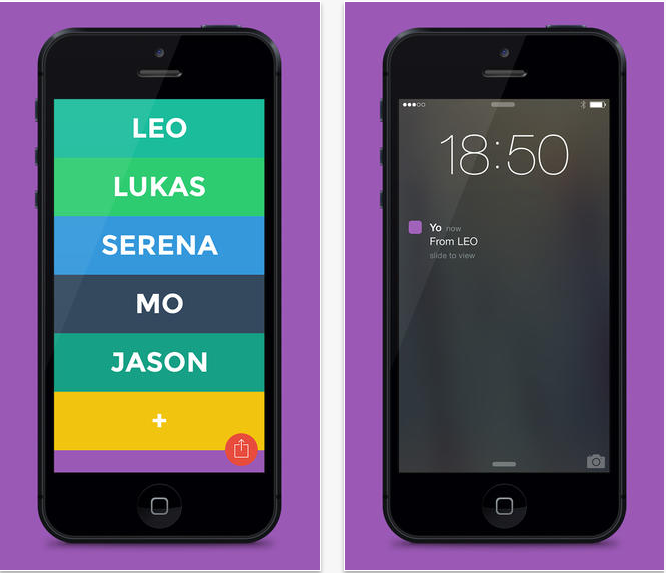 Yo’s potential is more than a simple tool for communication between people who understand context. One can imagine it being set up in conjunction with IFTTT to provide all manner of notifications. This can, of course, be done with traditional messaging but there is something about a pure notification that may be attractive to people. It may be more readily cross-platform than current phone notifications, for instance. It could work on your Fire Phone and iPad, for example. In that sense, it could be widely adopted. It could also have group messages for additional context (imagine a fire alert in a school; “you know its bad when your teacher yos”). That said, that all depends on execution. There is nothing to stop anyone from providing a better ‘Yo’ that is even easier to work with as a platform. I’d prefer ‘Oi!’ but there you go. First Twitter slices off the status update, now Yo has away with poking. So to speak. Does anybody care if Facebook is annoyed? It’s not as if Facebook hesitates to annoy us! i found Yo fascinating… the actual word could even be not so relevant – although it clearly connects with some (large) portions of young users – but it is a clever evolution of many things of the past, such as drop calls (how many people in their 30s just used basic Nokia mobiles to drop calls to their new lovers etc) and beepers. With so many people now just using smartphone to do everything but making phone calls, it could become an effective way of interaction (perhaps even while you are still using another app). According to Wikipedia, drop calls are rather extensively used in South Asia, Philippines, and many African countries as well as in India and Bangladesh… which may suggest that the app could be used as a Trojan horse in these markets in which other US-led social networks/apps struggle to establish a strong presence. In addition, the app could become an aggregator of notifications sent by other apps (they could monetize the service perhaps this way) and could be also a very clever way to tap into the likely diffusion of wearable tech objects (including fitness bands)… and usage could also suggest new ways of leveraging YOs and perhaps unexpected forms of monetization. The fact that one needs an appreciation of the context to understand YOs could also resonate a lot with young users who want to fully cut their parents off from their communication channels. Etc. In any case, the fact that they got a good amount of money to take it to the next level is not so surprising. The idea is fascinating. This program is ingenious, but I don’t think the problem is clones, the problem is whatsapp will just eat it. You could have a whatsapp shortcut (or widget with more contacts) on your home screen that sends “Yo” and then what is the point of this app? one button press, plus afterwards you can have an actual conversation if you want to. Facebook should get on this too. They already have the poke option.